This packet is filled with COLOR, so a color wheel project would naturally work (grades 1-5). The abstract paintings suggest a project using WARM or COOL COLOR (second grade), COMPLIMENTARY COLOR (grades 4 & 5), mixing SECONDARY COLOR (first grade), mixing INTERMEDIATE COLOR (grades 3 & 4), or COLOR VALUES (Tints and Shades—grades 3-5). 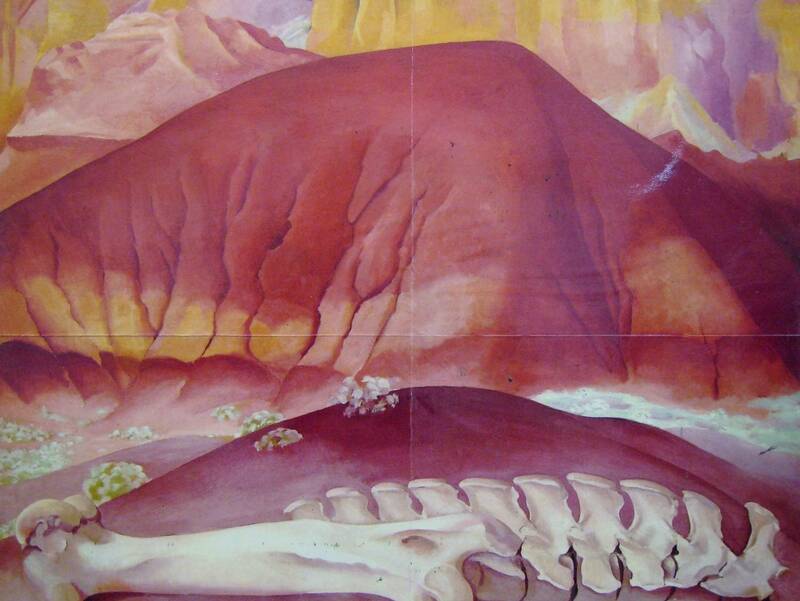 There are many examples of curved LINE to point out in Georgia’s flower paintings, abstract paintings, Open and Closed Clamshell and Red Hills and Bones paintings. 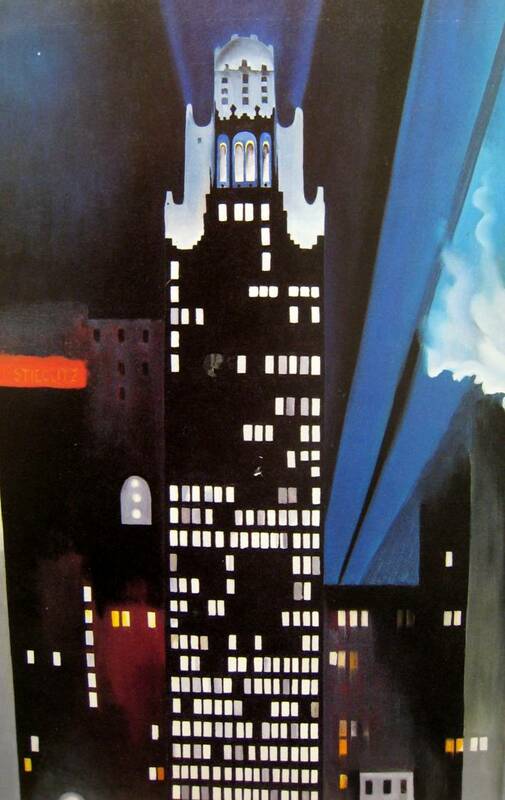 New York with Moon and Radiator Building-Night, New York illustrate many examples of straight and diagonal LINE. These two paintings are also good examples to use in a discussion of SHAPE (geometric). Discuss and define organic SHAPE (Red Canna, Morning Glory with Black, Oriental Poppies, Open and Closed Clamshell, Red Hills and Bones) and abstract SHAPE (Gray Line with Black, blue and Yellow, Pink and Blue Music). (*Grade level suggestions are based on Washington State Essential Academic Learning Requirements). Be sure ALL 11 pictures are returned to the Packet Carrier after your Presentation. 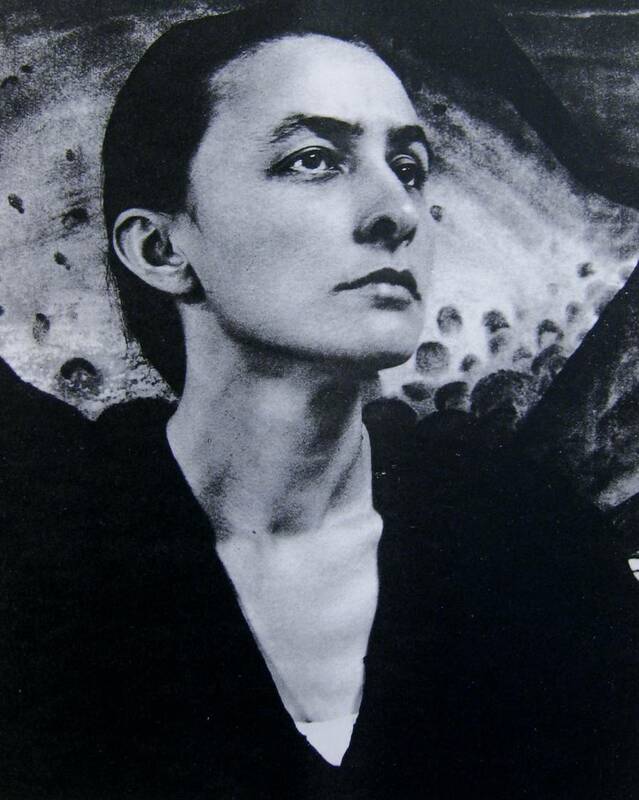 Georgia O’Keeffe was born November 15, 1887, on a farm in Sun Prairie Wisconsin. She was the second of seven O’Keeffe children. Even as a child, Georgia wanted to be an artist. She spent hours each day drawing and painting. Her mother gave her books to study drawing and arranged painting lessons for her and her sisters every Saturday. Georgia especially enjoyed watercolor painting but became tired of her lessons because her teachers were having her copy pictures. She preferred to do her own original art experiments at home. When Georgia was a young girl, her mother Ida never imagined it would be possible for her daughter to become a painter of fine works of art that would hang in museums throughout the world. In the late 1800’s, women’s art—baskets, quilts, pottery, decorative drawings and paintings—was not considered important enough to be exhibited in art museums. Ida wanted all of her daughters to learn to paint decorative items, which she thought would help them become “proper ladies” of society. She hoped her daughters might even become art teachers someday. When Georgia was ten years old, she and her sisters took painting lessons. By the time she was thirteen, Georgia knew in her heart that she wanted to be an artist. Georgia went to art school, in 1905, at the Art Institute of Chicago. Since the turn of the century, female students had finally been admitted to most American art schools. Even so, in 1905, Ida O’Keeffe was considered ahead of her time for sending her daughter to a worldly art school. During the first day of anatomy class at the Art Institute, students drew pictures of a male model that wore only a loincloth (like an Indian). Georgia was embarrassed but soon got used to it. Most people during Georgia’s days thought this type of required art class was not proper for a young woman to attend. 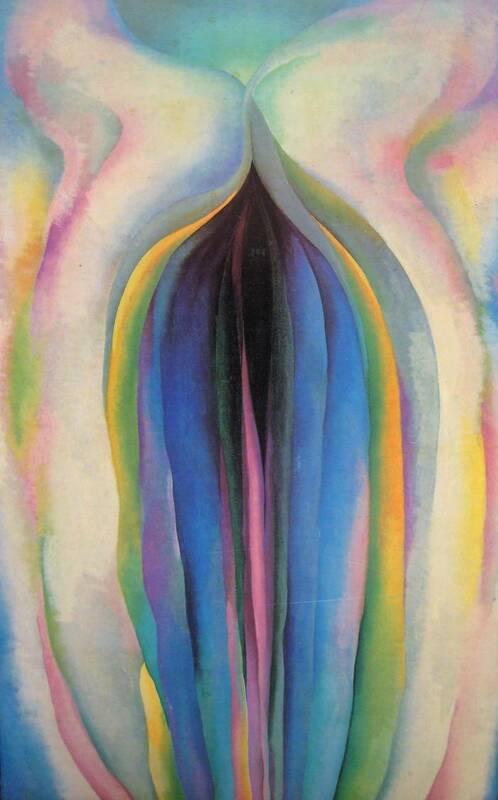 This resulted in very few women being enrolled at the art school. Georgia wanted to paint what was important to her but her teachers felt she should study painting by imitating the works of other artists. Georgia’s teachers wanted her to paint what they saw, instead of what she saw. Her vision of art was original and imaginative. She didn’t like to draw or paint what others had created. When she discovered that some of her art resembled that of other artists, Georgia destroyed it. 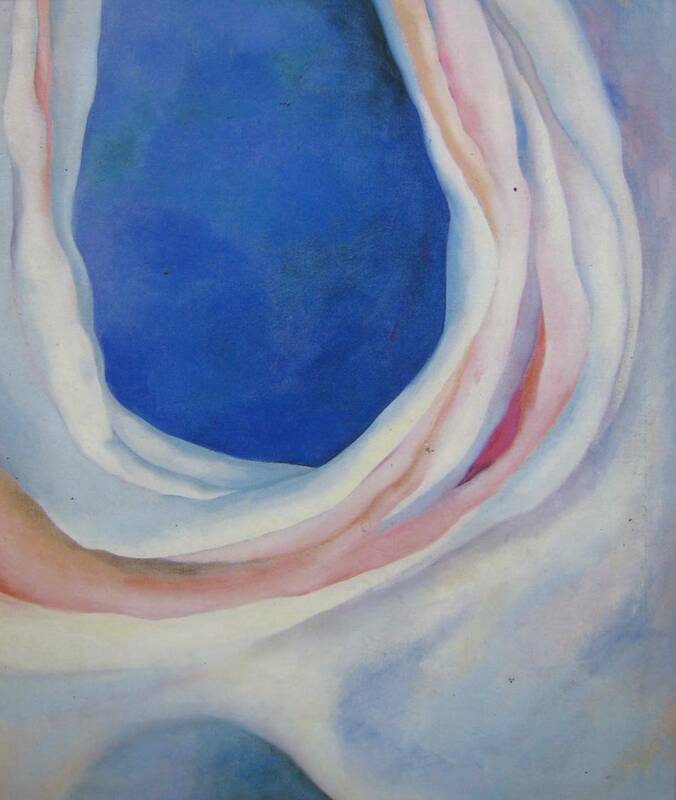 After she finished school, O’Keeffe became an art teacher in Texas. She enjoyed the landscapes of Texas very much, and the plains, ocean and sunsets there later played an important part in her painting. Soon Georgia was living and painting in New York City. A very close relationship between Steiglitz and O’Keefe began. As artists, they supported each other’s work and drew inspiration from each other. In 1924, Steiglitz and O’Keefe were married. Steiglitz took many beautiful and unusual photographs of Georgia during their long relationship. 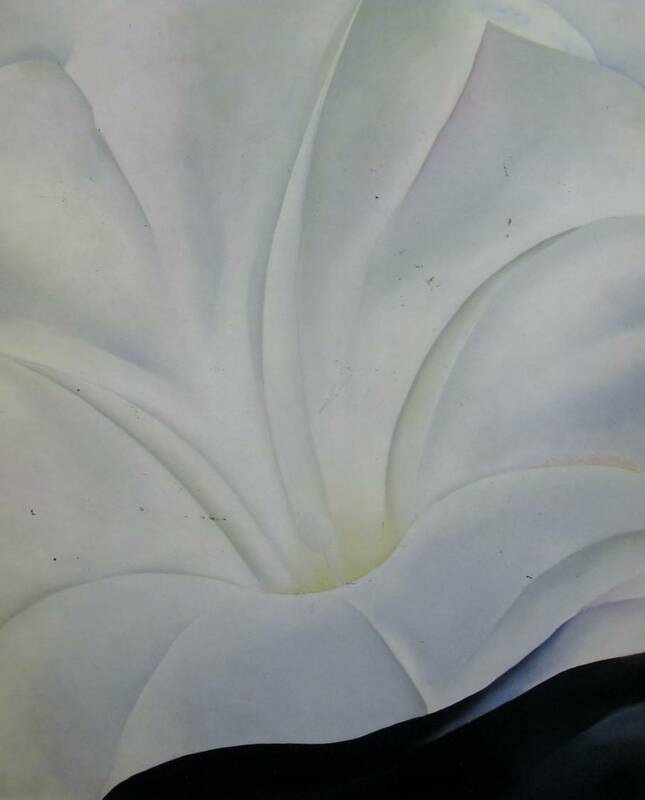 (Display photograph of Georgia O’Keeffe.) Some photographs were so unusual that they show us only her hands, or neck, or back. Alfred’s photographs of Georgia are very simple and stark, much like Georgia’s paintings. Almost from her very first exhibition, Georgia had success as a painter. During the period from 1916-1919, her work was very abstract (EXPRESSIONISM). As her own personal vision of art became more defined, her paintings turn more toward reality (REALISM). Georgia portrayed the world simply as she saw it and her vision had many unusual perspectives. Throughout her lifetime, Georgia painted hundreds of flower images of every color, shape and variety. Cleverly, she increased the scale, or size, of her flower paintings to fill very large canvases and appear much larger than the real flowers. When people asked her why she made her flowers so large, Georgia asked them shy they never wondered why she made her rivers so small. Poppies were one of Georgia’s favorite subjects. This painting shows two blossoms filling the canvas in SYMMETRICAL BALANCE. To achieve symmetry, Georgia positioned the flowers evenly so that if the canvas were folded in half, each side would appear roughly the same. 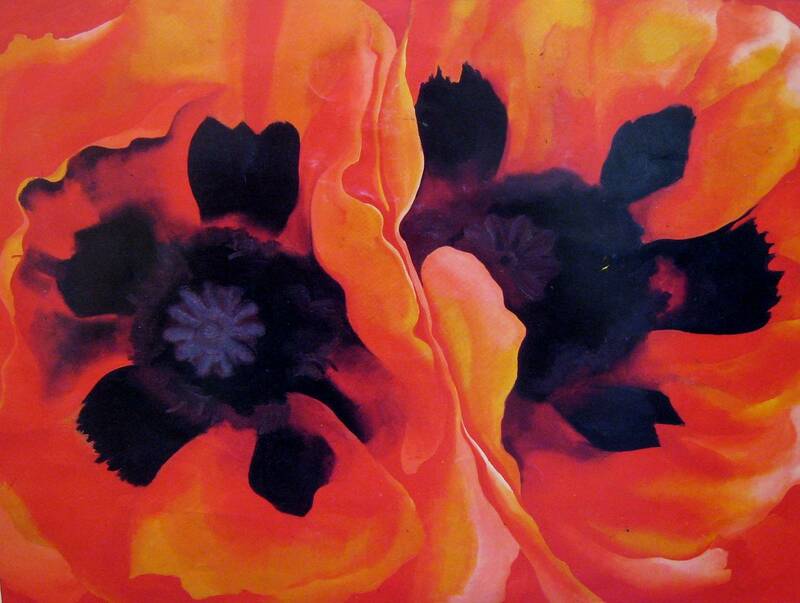 She used warm colors for the petals of the poppies. The centers of the flowers are velvety dark shades, which contrast against the light tints of the edges of the petals. This draws our eyes deep into the center of these flowers. (K-2) On a small piece of white construction paper, draw a flower that covers the entire page, from edge to edge. Draw lightly with a pencil (in case kids misunderstand and draw their flower too small, they will be able to erase). Volunteers should be sure to walk around the room and be sure they understand what you want them to draw. A simple line drawing example would help kids understand the assignment better. Kids should color their drawing with crayons, using either warm or cool colors. Be sure to review, which colors are warm and which colors are cool before kids begin coloring. (3-5) Older kids can draw their flower on larger size white construction paper. To help kids draw large, suggest that a portion of the flower should touch each of the four edges of the paper. Paint the flowers with watercolors using warm or cool colors. You might have them create two flower pictures—one with warm and one with cool color. Georgia has painted some tall buildings in New York City, from a very unusual perspective. This is a Cityscape. The painting begins at a level that is higher than the street. There are many geometric SHAPES in this picture. How many circles can you find? Triangles? Can you find any rectangles or squares? What is the first thing your eyes see when you look at this picture? How do your eyes move through the picture? 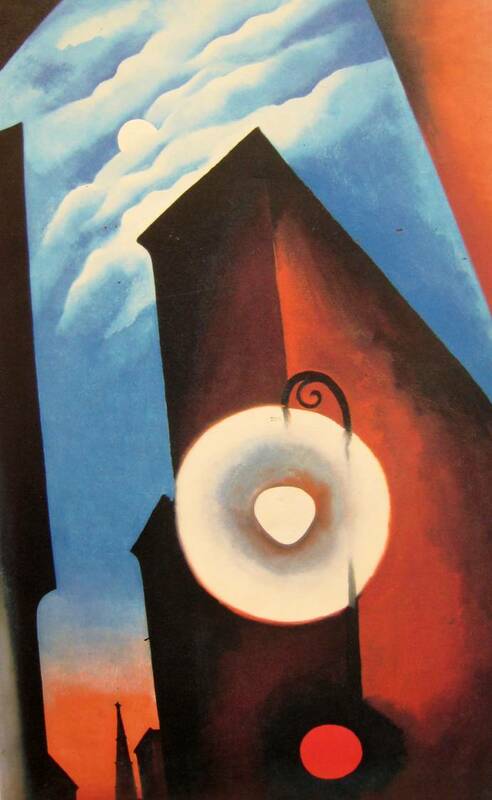 The center of interest is the street light with its circling glow of light. Then our eyes travel up the building to the moon and clouds in the sky. Eventually, our eyes travel back down to the red dot at the bottom and the church steeple. What do you think the red dot at the bottom of the picture is? A light? This is another interesting Cityscape. Notice how Georgia painted the windows different shades of white, gray, yellow, orange and red. There are even some black rectangles of windows. Most of the windows, with their light turned off, blend into the black of the buildings but in some spots the buildings seem to reflect light and are not totally black. Can you find a larger, arched window in the picture? Can you see the city spotlights? The drifting smoke (or steam)? What is “Steiglitz”? The last name of Georgia’s photographer husband, who had an Art Gallery in New York City, called “291”. Point out the unusual SHAPE at the top of the center building. Can you see the light reflecting from this shape? Can you see a star in this picture? It is a small white dot in the top left corner of the picture. Create a cityscape at night by cutting black or gray rectangles, squares and triangles and gluing them across a sheet of gray or blue paper, turned horizontally. Cut some small yellow, gray or white rectangles for windows. Cut a moon from white or yellow paper. You might also add stars (dots) with a white or yellow gel pen. Remember, cities have a lot of light so it’s hard to see many stars. Draw a cityscape like the example page Skyline Pictures. Add windows, towers, roofs, smokestacks, or domes. You can create various patterns with the different shaped windows of the buildings. You can even create a building with arched or stained glass windows. You can change the time of day it is by the color you choose for the background. You can add clouds for a daytime sky or stars for a nighttime sky. Now you can you draw a city skyline of your own! What COLORS do you see in this very colorful watercolor painting? The Primary Colors are red, yellow and blue. These hues are true colors. This means that no other colors can be mixed to produce the Primary Colors. Where is the Gray Line? In the very center of the picture, where some black has been added. All of the colors that meet in the center are shaded. Does this painting have ASYMMETRICAL or SYMMETRICAL BALANCE? Symmetrical Balance because it is roughly the same on each side, if you divide it in half down the center. This will help kids see the direction they are going to paint in and how to paint their own lines close together. Tape a sheet of white construction paper, on all four sides, to the desk vertically. Wet the sheet completely, by spraying with a water bottle. Let this soak in and spray a second time to wet any dry areas if you need to. Thin primary colors of tempera paint and use 1” or 2” sponge brushes. Beginning with the lightest color, yellow, wet the sponge brush, dip it into the thinned paint and create a few slightly curving lines, vertically, on either side of the center of the paper. Leave a lot of unpainted areas here as you paint about 4 yellow lines this way. Both the paper and the sponge need to be very wet so that the color will run or spread across the paper. Rinse the sponge thoroughly and be sure ALL the yellow paint is gone. Now, follow the same procedure with 2 lines of red, moving out on either side from the center. Rinse the sponge brush thoroughly. Repeat procedure with the blue color. Add more yellow lines now. Be sure that there are more lines of yellow so that the red and blue can blend with the yellow. Fill in any empty spaces with more wet color. When the entire paper is filled with color, take a small paintbrush and black watercolor to paint a gray line near the center of the picture. Be sure that the black does not overpower the colors and that the paper is still wet. If you painted the black line too darkly, spray with water to lighten it. 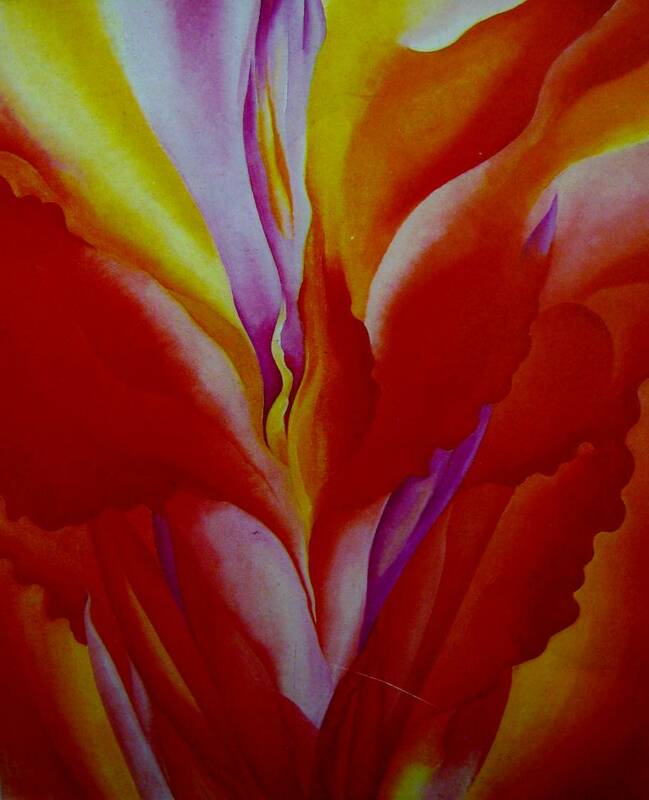 This abstract painting shows a MOOD or a feeling. What you see here is the way that music Georgia was listening to made her feel as she painted. Pink and blue are the colors the music reminded Georgia of. What type of music do you think she was listening to? Do you think it could have been a baby’s lullaby? When Georgia was painting this picture, the music made her mind see the colors blue and green. What type of painting is this? A Landscape, which is a scene of the outdoors. 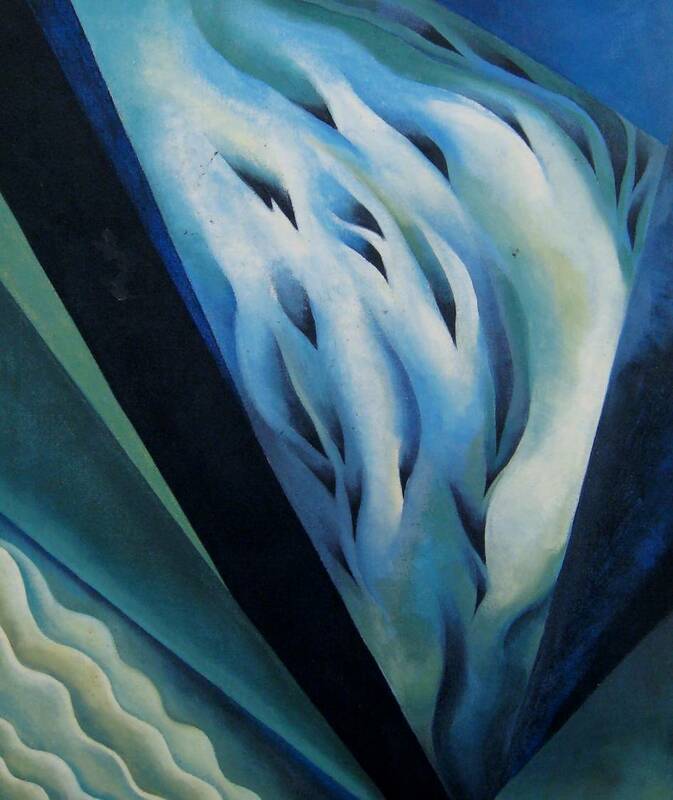 This painting was inspired by the desert hills of New Mexico, where Georgia O’Keeffe owned a ranch, near Santa Fe. Is this a REALISTIC or EXPRESSIONISTIC Landscape? Georgia has simplified and exaggerated so many aspects of this picture that it is somewhat ABSTRACT. She meant to create a feeling of the landscape that she loved. Does it look like a desert? Can you tell if it is hot? Why do you think Georgia included the bones? Explain that she collected objects from the desert to show “all the life that has been lived in a place”. What relationship does she suggest between the hills and bones? Which are older—the hills or the bones? Which is more important? What takes up the most space in the painting—the hills or the bones? Why do you think she included flowers? What COLORS did the artist use for the hills? Are they WARM or COOL? Notice the subtle sunlight as the colors change from pink to orange to purple. The whiteness of the bones is a stark contrast against the strong hills of the background and the fragile, wispy flowers. Can you see how Georgia causes us to think about the connection between the hills and the bones? Are they alike or different? Peaceful or frightening? Where do people fit into this view of nature? Paint a desert landscape using warm colors. See if kids can tell what this is a picture of, before you tell them the title. 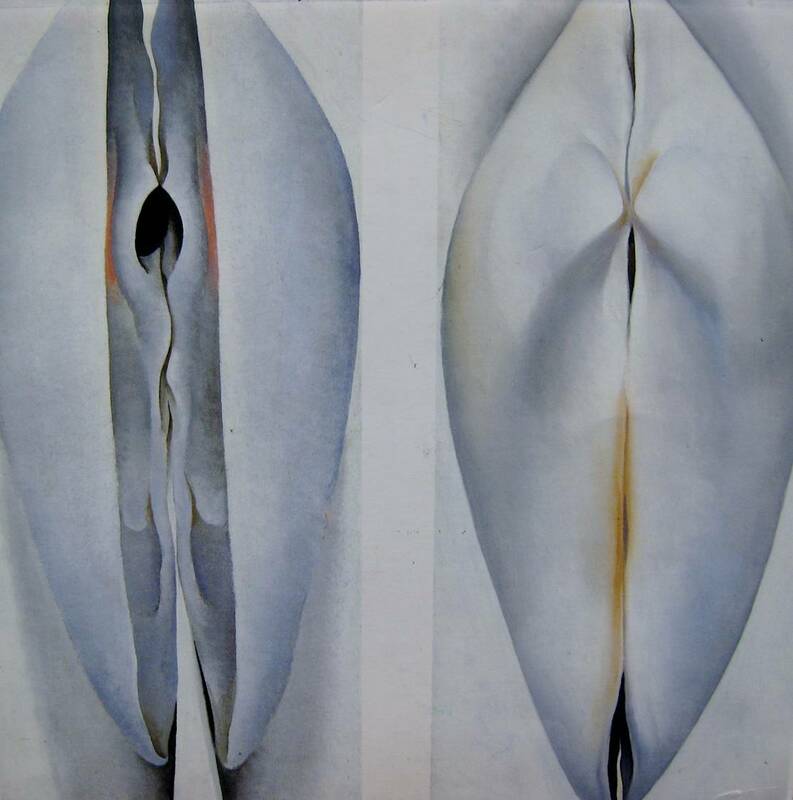 O’Keeffe has focused so closely on the shells they have become almost ABSTRACT. Bring in a real clamshell to paint or draw. Bring in a different type of large shell for the kids to paint or draw from a close focus. Create a Still Life arrangement with various and assorted shells and driftwood. Give kids colored chalk or oil pastels to create a Still Life picture.